Unlike last few years, December of 2015 was going to be different. Instead of taking another long road trip in US, this time we headed to India to attend some weddings and family functions. Spending time with parents and exploring some new destinations in India was added incentive, like Lucknow, Jaipur and Delhi. We flew to Delhi from Chicago with a stop over in Vienna. Arriving at T-3 Terminal at Indira Gandhi International airport in Delhi, India’s window to the world has always been a relieving experience because that means the completion of 18 hours long flight. With all the jet lag and stiff back, our plan was to take the overnight train from Delhi to Gorakhpur, our final destination. But as we all have experienced once in a while, some of the best laid plans also go haywire. Similar thing happened here when we realized that our train tickets remained in waiting list and were not confirmed. 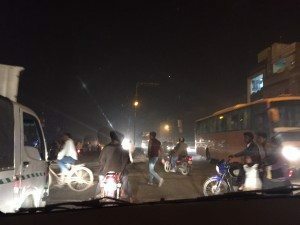 So we had two options now, either fly to Lucknow and from there go to Gorakhpur by road, or hit the road from Delhi itself, drive all the way to Lucknow and later to Gorakhpur, and explore the dusty plains of Uttar Pradesh along the way. 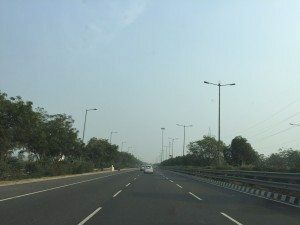 For a travel enthusiast like me, a road trip in India was due for quite some time and I had been thinking of driving on Delhi to Agra expressway for last two three years. With no hopes of getting train tickets, now we had all the reason and option to fulfill that dream and we grabbed that by both hands. We were total 7 people including 3 kids for this trip and hence we hired Toyota Innova for the trip and started for Lucknow in the afternoon at around 2 PM IST. Idea was to reach Agra by evening so that we can enjoy the Yamuna expressway drive before it becomes dark. 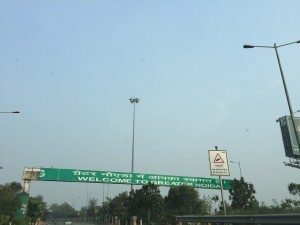 Driving from Chitranjan Park, New Delhi we took the road via Noida and Greater Noida before getting on Delhi Agra Yamuna Expressway. 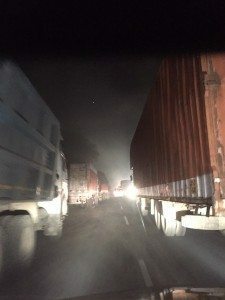 This expressway was built 2 years back and can be counted among some of the best road infrastructure India had built recently. Six lane roads with the maximum permissible speed up to 120 Km per hour, it allows you to enjoy the speed and comfort together. Driving on this expressway, you will notice huge construction activities on both side of the expressway, especially in Greater Noida area. Residential towers, golf courses, plains and farmlands and in between Buddha International Circuit (http://buddhinternationalcircuit.in/), India’s only Formula one Track, offers a closer look at slow transformation from agrarian economy to market driven forces that India is going through. 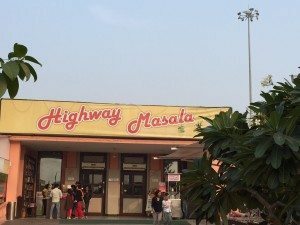 Another pleasant surprise on this expressway was carefully planned service roads and service areas especially with some good dhabas. 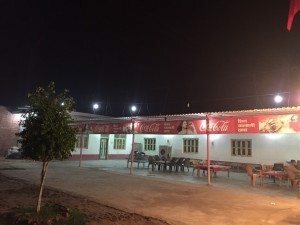 In Northern India, dhaba or roadside restaurants are the best way of exploring the local delicacies and they have been around for so many years that road trip in India is not complete without a stopover at some dhaba. We stopped at one of the service area that had this dhaba called Masala Cafe. A folk dancer dancing on some folk songs and collecting money for her family and siblings, added more colors to the surroundings. After some quick snacks and typical North Indian staple food like Rajma Chawal, Chole Chawal and lassi (butter milk) we were back on the road. 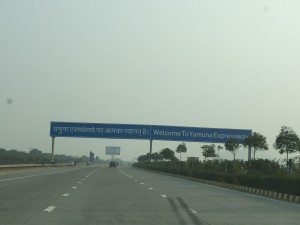 Once you cross Agra, Yamuna expressway ends and starts the cacophony of all kinds of vehicles on the road competing with each other for the space on double lane road. With constructions happening everywhere the stretch immediately after expressway takes all the romance out and makes you little more impatient. It was getting dark by now, and the landscape also changed drastically as we crossed the towns and villages dotted along NH2. By the time we were crossing this stretch, it was already getting dark, and most of us in the car were sleeping. Some with the jet lag and some just tired. Navigating along with all the tucks and jeeps on the road we managed to cover next 200 kilometers in 4 hours. After Agra we drove past the twin cities of Firozabad and Shikohabad, both these towns have rich historical past. In Fact drive from Delhi to Lucknow via Agra, Mathura and Aligarh also takes you very close to history of ancient India. This whole corridor has some of the best contributions of Mughal empire to the rich and mixed heritage and architectures of India. Although we did not had time to go for Taj Mahal or Fatehpur Sikri, or many other world famous monuments in this trip but a promise is made to be back again. In last many centuries every empire and kingdom that ruled Delhi, expanded into Hindi heartland via this route to consolidate their base and power. Millions of soldiers and traders have travelled this distance over many centuries to make India, what it is today, a melting pot of numerous cultures, religions, beliefs, languages, history and humanity. As we drove closer to city of Kanpur, road conditions continued deteriorating and in some places it was just pathetic. 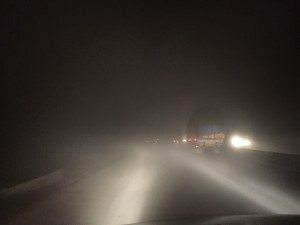 Along with heavy vehicles that came on the highway in night and fading visibility due to fog, the last stretch of drive was difficult and tiring, but we continued without any further stops. After few more hours of drive we entered in main city of Lucknow around midnight, and reached our destination. 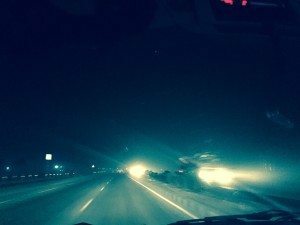 As we were driving through the city of Lucknow, I kept looking outside to see the city that has been my alter home for more than 20 years now. A city where I first dreamt of bigger things in life, a city where I came back again and again for all those competitions and entrance exams for graduation. Lucknow is also known as City of Nawabs, a city with centuries of colourful history and heritage to share, a city that has seen India growing and becoming what it is today, home to 1.25 billion people, multiple religions, languages, beliefs and vibrant democracy. Irrespective of few patches of bad roads and traffic congestions, driving from Delhi to Lucknow has its own share of romance, history and heritage all together, you just need to keep your eyes open. This post has already been read 1727 times!